Artikkel "Forsøker å speile samtiden" Sandefjords Blad September 10 2018: Click here. Article "Il premio speciale degli Ambasciatori Antonio Gabriele" Certamen Ciceronianum Arpinas XXXVIII edition 2018: Click here. Article "Tok med 30 malerier hjem i kofferten" Sandefjords Blad Norwegian newspaper April 28 2018: Click here. 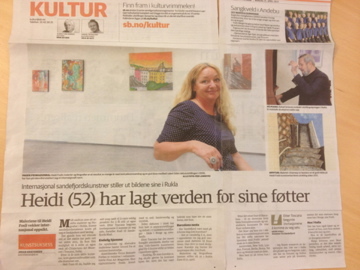 Newspaper article Success for Heidi Fosli Sandefjords Blad February 28, 2017: Click here. Digital media article Diocesisora.it published in Italy February 27, 2017: Click here. Newspaper article New Weekend, New Award for Heidi Fosli from SB July 28, 2015: Download PDF here. 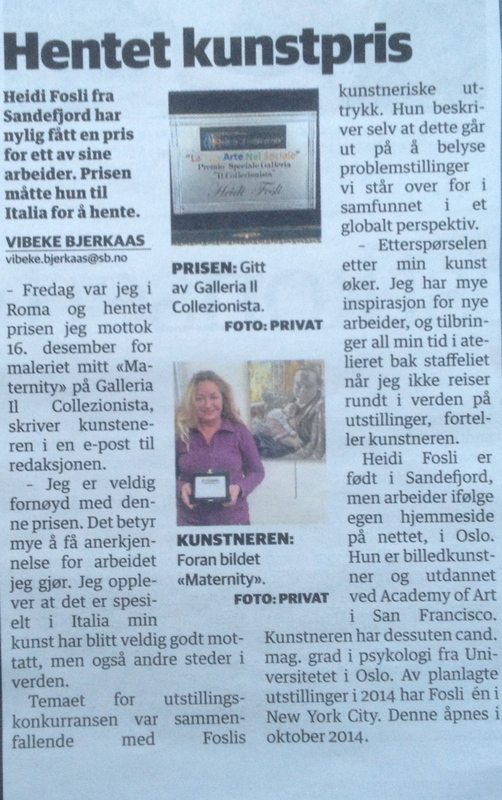 Newspaper article Prize collecting Sandefjord Artist from SB July 14, 2015: Download PDF here. 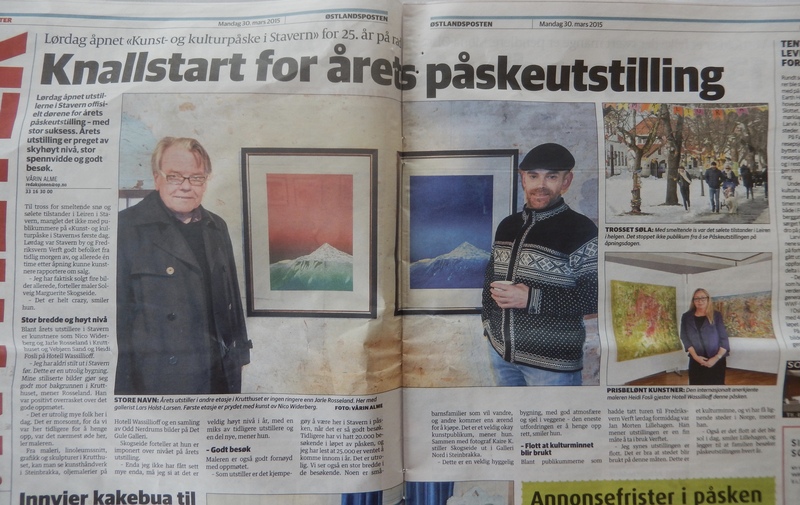 Exhibiting in Venice norwegian newspaper article SB April 28, 2015: Download PDF here. Newspaper article from norwegian Østlandsposten March 30 2015: Download PDF here. Article Thrilled students from Marconilecture from SB February 13 2015: Download PDF here. Article Marconilecture for Fosli from Il Quotidiano Latina, February 07, 2015: Last ned PDF her. Success in Italy from Sandefjord Blad 2014: Download PDF here. 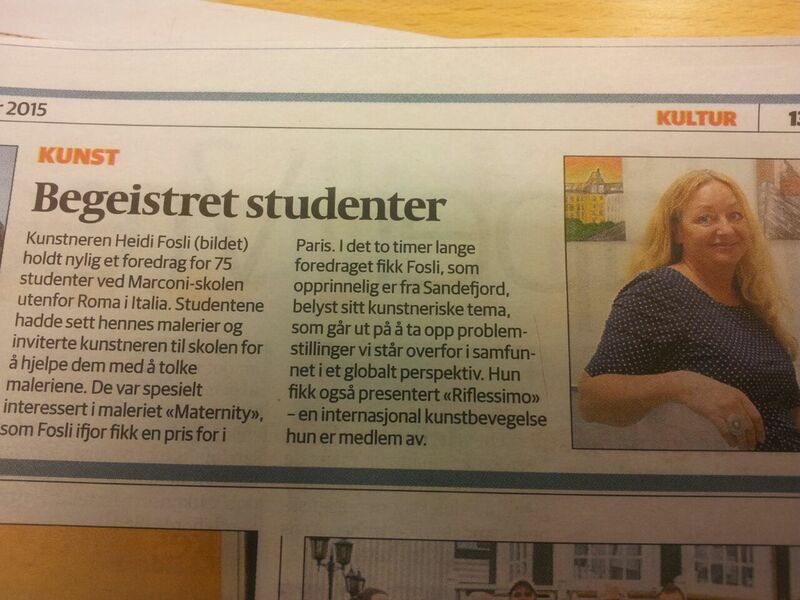 Article for Norwegian newspaper Award in Paris for Fosli from Sandefjords Blad, December 16 2014: Download PDF here. 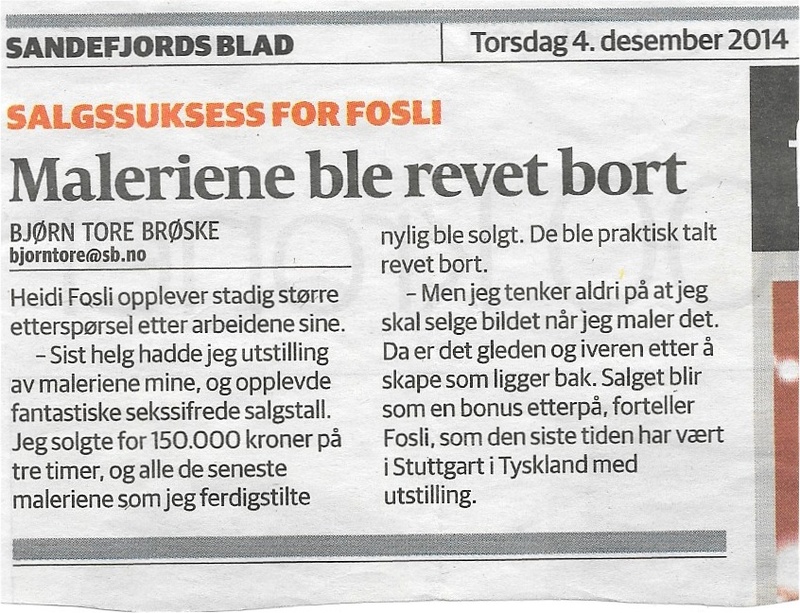 Article Sales Success in Norwegian newspaper for Fosli from Sandefjords Blad, 04.desember 2014: Download PDF here. New award for Heidi Fosli from Sandefjord Blad November 6 2014: Download PDF here. 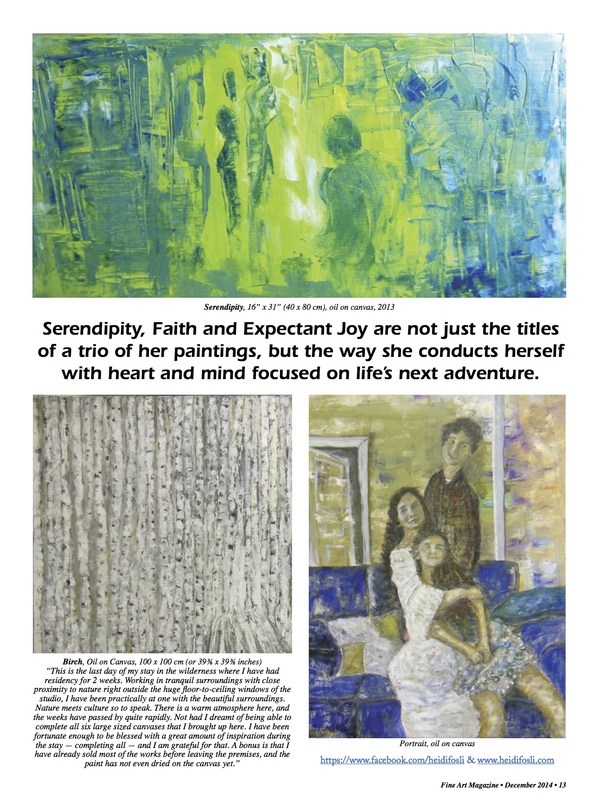 Fine Art Magazine p1November 2014: Download PDF here. Fine Art Magazine p2 November 2014: Download PDF here. Debth portrait interview close-up from Austmarkingen Living the Dream, October 2014: Download PDF here. Debth portrait interview from SB, October 3 2014: Download PDF here. NRK national radio channel interview, September 23 2014: Download PDF here. Exhibiting at Louvre from Aftenposten, August 19 2014: Download PDF here. 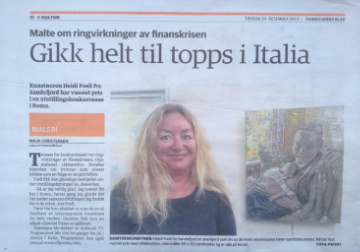 Italia says loud hello to Heidi from Sandefjords Blad, July 2014: Download PDF here. First page news from Sandefjords Blad, July 2 2014: Download PDF here. 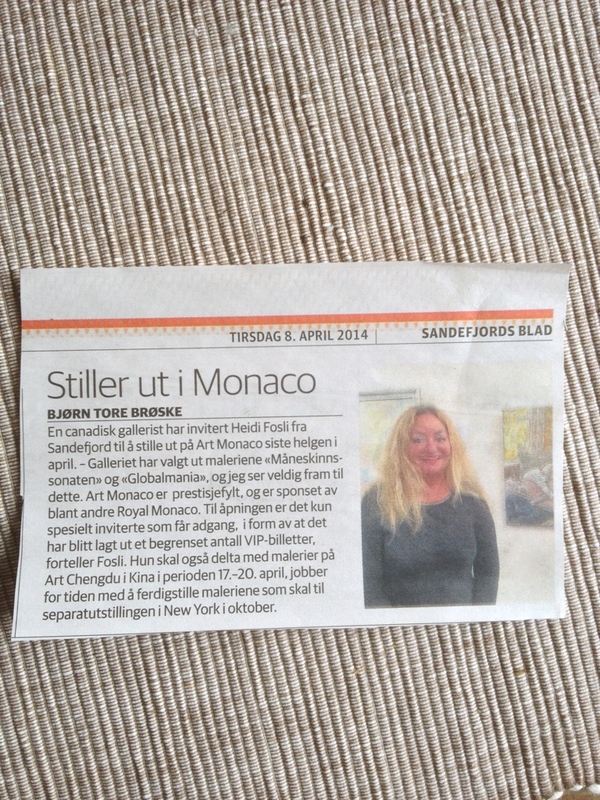 Exhibiting in Monaco from Sandefjords Blad, April 8 2014: Download PDF here. Went to pick up award from Sandefjords Blad, December 2013: Download PDF here. 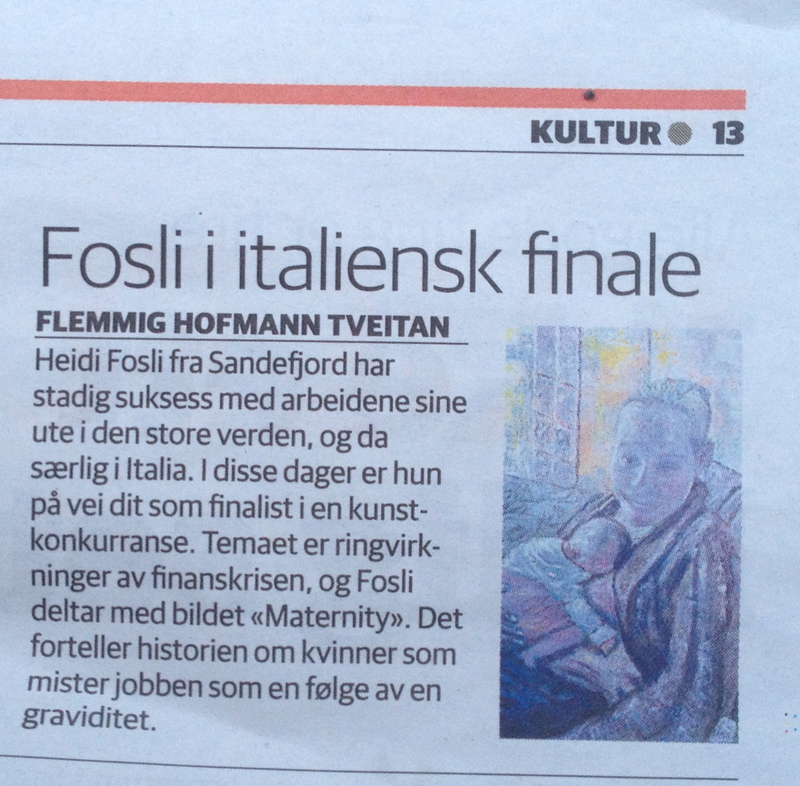 Fosli in Italian Finals from Sandefjords Blad, December 2013: Download PDF here. 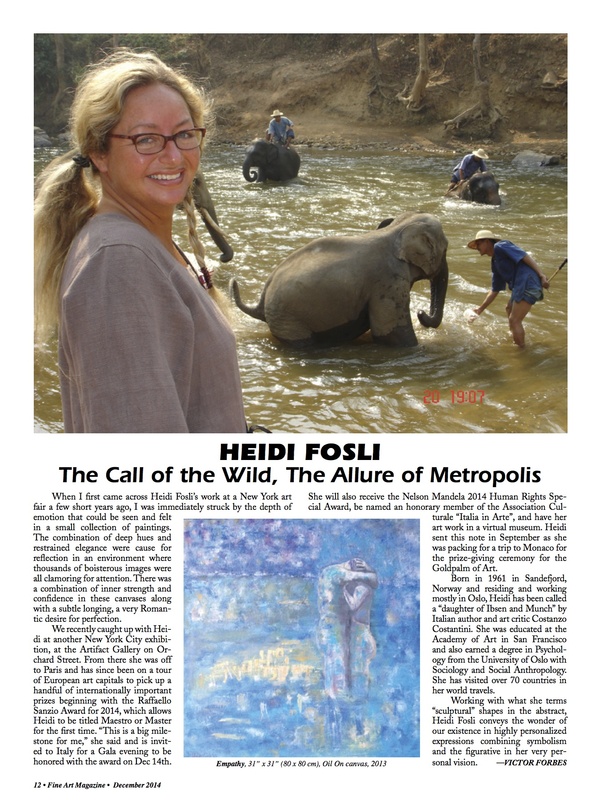 Ingredients in Heidi Fosli´s Success, Art News Report September 2013: Click here.